First off this lady is HILARIOUS!!! I think she speaks to my own heart. The best part is that there is no way you can tell from this blog how sarcastic I am and she still chose me! I really love that her blog speaks to all most moms. We all need to stick together through these kid times and this lady makes that all possible! So thanks for speaking the TRUTH about the 'real' Joys of mothering! And now. I would like to thank my parents for having me..... just kidding. Pass along the award to 6 newly discovered bloggers. 6~ I LOVE LOVE LOVE candy. If it was a food group I would for sure meet the daily alotted serving. 5~ My day gets instantly better when I get my Dr. Pepper with extra Sonic Ice! 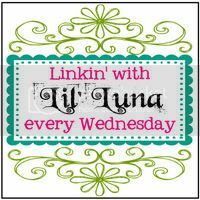 1~ Ask ANYONE who knows me if they ever thought I would have a blog like this and they will tell you NO! Thanks again to thoughts from this mom for being a reader! One of my favorite things about spring/summer is Salad! I try really hard not to turn on the oven because it is way to hot in the AZ summer. So, with that being said you will probably get a ton of salad recipes over the next couple months. I know that some of you are not yet having this obnoxious weather but since it is suppose to be 98 here last week I figured that, that counts as summer right? Do any of you use pampered chef stuff? Well, if not this product is one of my ABSOLUTE Favs! 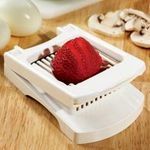 It's and egg slicer but, I use it for strawberries mostly. Just make sure you put the berries in bottom up so you don't break the wire. Slice strawberry and dice cantaloupe. Put in a large bowl with spinach. I know the dressing recipe sounds gross but it is soooo good. And you won't even realize that it has Mayo in it! If you are Vegan you can use veganaise and you can't tell either. Anyway this dressing goes a LONG way so only use a little at a time and toss until it is well coated. Also, the is great for parties and showers. Don't put the dressing on until ready to eat so it doesn't get soggy. I make up the dressing and then just make a small personal sized portion for lunch. It is also AMAZING with a fresh grilled chicken breast! Enjoy. OK so I have a small ok LARGE obsession right now with Banners. Or as my neighbor informed me they are called Buntings. I love them. I think they are so cute and that they have such a fun clean feel! ﻿I attempted a valentines bunting first. I did ok. I have to work on my sewing machine but I will do a new one next year. My Birthday and My sons birthday are this month and for years I have been hanging one of those dollar store cardboard Happy Birthday signs! NOT ANYMORE! ﻿I am quite pleased with it? What do you think? Anyway, for my birthday (today) I am giving away this cute Easter Banner! If you want to enter head on over to Lolly Jane and follow the instructions! Also, If you want to join the follow along party head on over to Making the world cuter for all the deets! So I want to preface this recipe by saying that I do a lot of recipes that you can use things from your 3 month and/or year supply. We all have different things in our supplys but I thought I would give you a list of some of the basics in mine. That is just a couple. I will do a future post on how I SLOWLY got my 3 month supply. It is overwhelming but I think I can simplify. Anyway, Back to taco salad. As I said I use some stuff so that I can rotate but I use fresh when I can! Brown Hamburger, add the corn, beans, olives. Cook until all is warm. My boys like a big helping of the meat mix with lettuce, tomato, cheese, onions, and salsa and then scoop up with the chips. I like to make a salad with the lettuce and tomato and onion then put some of the bean and meat mix on top! You can also put sour cream. I like to mix salsa with Ranch! I have also made my salsa recipe so that you can use your supply items as well. If needed I use fresh when I can! cut up the veggies and put in blender. Use 1/2-3/4 the can of el pato. The more the spicier it will be. Add the can of tomatos. Then do 2-3 shakes of garlic powder, 2 shakes stevia or a heaping spoonful of sugar! Salt and pepper to taste. I put enough pepper to cover the top! Then blend to desired thickness! WARNING! Its Goood! Ok so I saw this tree and these eggs on the Pottery Barn and PB Kids Websites. And since my law school income :) does not afford me those luxuries yet(hopefully) I decided to make my own version! I got the whole thing for less that $20! I purchased the everything at HL. All the Easter Stuff was 40% off. I bought the eggs that are on the tree plain. Then I added vinyle lettering. The eggs at the bottom I bought a bag of different sized ones and then I did what I did on my Halloween Topiary seen on Lolly Jane. I took festive napkins and modge podged them to the eggs. I love the result they look almost dyed. Sorry that my picture taking skills are not as good as my bowstaff skills but you get the general Idea! Happy Easter...a little early! Ok so I have a couple of fun giveaways to tell you about! First, My friend Aubrey at all things bright and beautiful is giving away a super cute book for freee! head on over and check it out! Second, My denim blog Denim lovers is giving away a free pair of jeans! whoo hoo so go there and find out how. Look How pretty these mix! Mix Sugar and butter til blended. (butter is better at room temp for baking) Add Egg. Blend well. Add Vanilla yogurt. Then zest and lemon juice. Add Dry ingredients and then mix. Don't over mix just until they are well blended. Make Puree. I use frozen fruit for baking. I think you get more flavour. If you have fresh raspberries put them in the freezer and then thaw and then put in blender or food processor. Next you will put your cake liners in pan. Put 1 Tbsp of mix into the liner. Then put a tsp of the the puree on top of the mix. Next put another TBSP of batter on top of puree. Stir around with a toothpick. You don't have to totally stir but just make a nice pattern. Fill all liners this way. Bake for 20-25 min depending on your oven. When you touch the cupcake it should bouncy right back up! Let cool completely before you frost! Ok I have done this a few times. I personally thing that imitation raspberry extract in this case tastes better. The real stuff tasted like alcohol to me. I like to double the recipe but I like a lot of frosting! Mix well! If you are not getting the texture you want add a little more powdered sugar but this amount seems to work fine for me! I am a wife, mother, sister, daughter, friend. I love to cook and create new and yummy things for my family to eat. I love to take a recipe and make it my own. I love to create fun and crafty things. The name pepper place came from my love of mine and my childrens freckles, the street I grew up on, and the yummy spice. I hope you will bare with me as I get this blog up and running. Please feel free to use any craft and/or recipe from this blog and make it YOUR own.